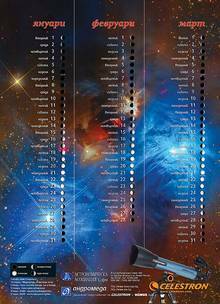 Looking for astronomy and nature-themed gifts for children and adults! We offer exactly what you are looking for. You can buy these products and many others from the office of the association or from our online shop. 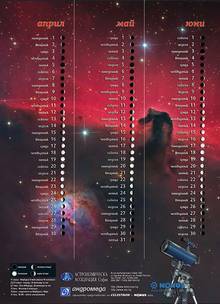 THE BOOK OF ASTRONOMY - 7 LV. 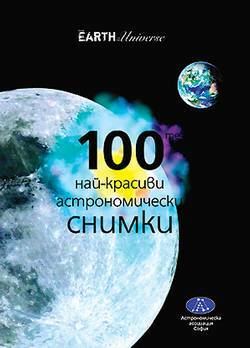 A new book about astronomy. 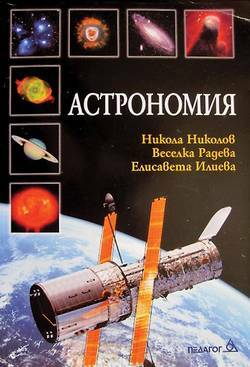 APPLIED ASTRONOMY - 10 LV. 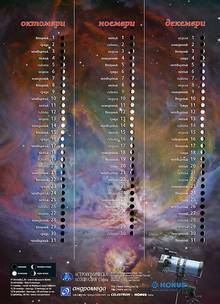 Panorama of the starry sky, Earth, Moon, and the Sun. 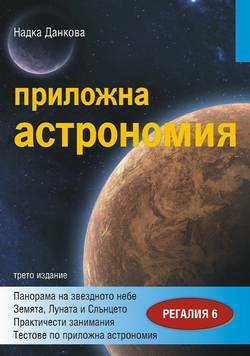 Practical exercises and tests of applied astronomy. Third Edition. 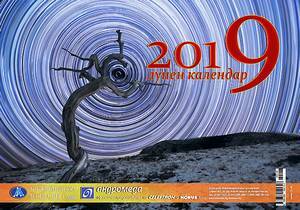 ASTRO CALENDAR 2019 - 10 LV. 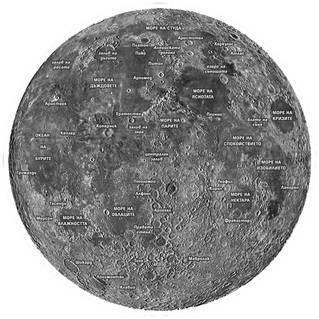 LUNAR CALENDAR FOR 2019 - 3 LV. 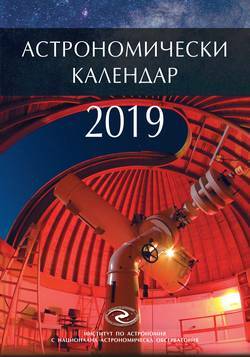 ASTRONOMICAL ALMANAH 2019 - 6 LV. 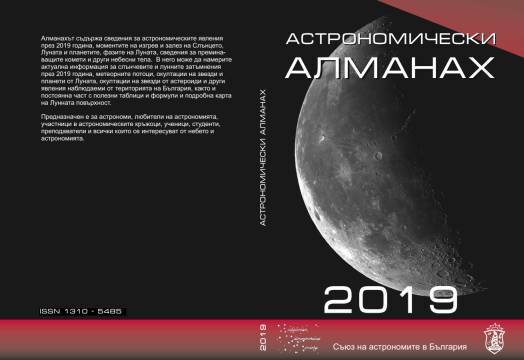 New edition of the astronimical almanah for 2019 of the Bulgarian Union of Astronomers. 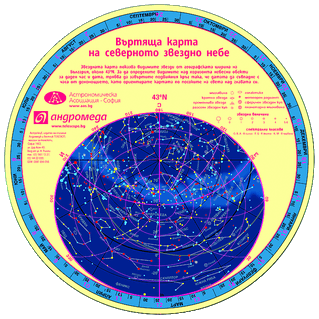 ROTATING STAR MAP - 10 LV. ASTRO PHOTO ALBUM - 9.90 LV. 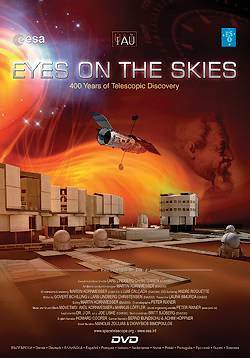 ESO FILM "EYES ON THE SKIES" - 10 LV. 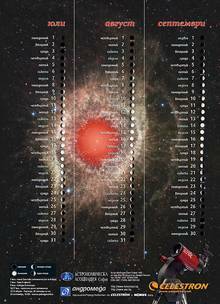 Telescopes - past and present. The story of the people behind them. Bulgarian subtitles. GLASSES FOR OBSERVING THE SUN - 3 LV. Our glasses are made from black polymer filter that conforms to the norms CE №89/686 and coms with a license of the material. These high-quality filters are very strong, do not tear, provide safety and reproduce a clear image of the Sun in orange color. These glasses filter out 100% of UV rays, 100% of IR rays and 99.999% of the brightness of the visible light.